(1) Dorrier Building (Corner of Valley Street and West Main) - served as a general merchandise and feed-grain store for many years until its recent conversion to a grocery store. (2-4) Carlton House - built c. 1840 and contained 3 entrances. 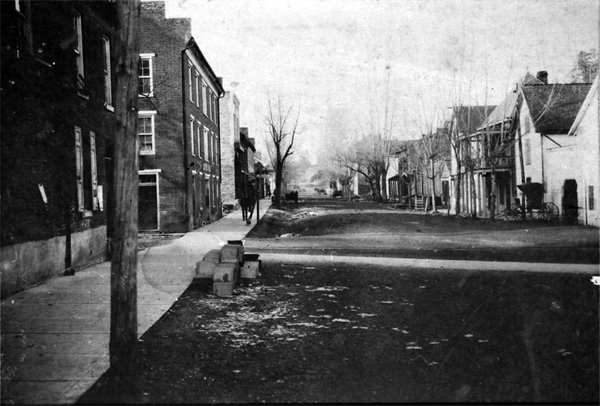 Entrance 2 at the corner of Valley Street and West Main was Dickinson's Drug Store; Entrance 3 at the center of the building was the Carlton House Hotel with its lobby on the first floor and stairs leading to the rooms upstairs; Entrance 4 was to Sclater Hardware Co.
(5) National Bank of Scottsville - David Pitts served as President and Walter Dorrier as cashier. (6) Post Office and Griffin Building - constructed c. 1840, these two identical brick buildings appear to be one structure. The first building was the town post office from 1884-1914. 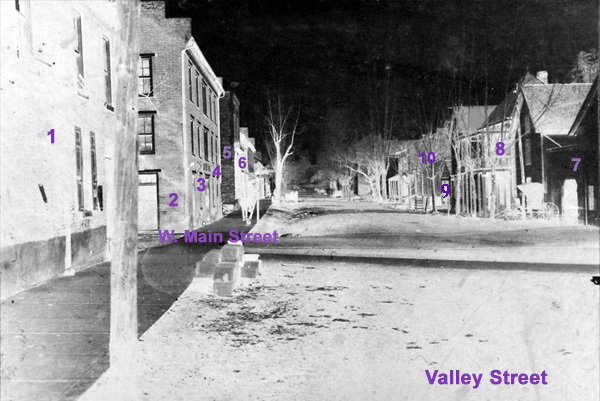 (7) Livery Stable - located on the northeast corner of Valley and Main St. Buggy and stable belonged to Charlie Harford. (8) Fidelity National Bank - this bank was owned and managed by Jacinto V. Pereira. Dr. Wade had his dental offices on the second floor of this building. (10) Moon Bank. Upstairs were the law offices of Hobhouse and Douglas Patterson.